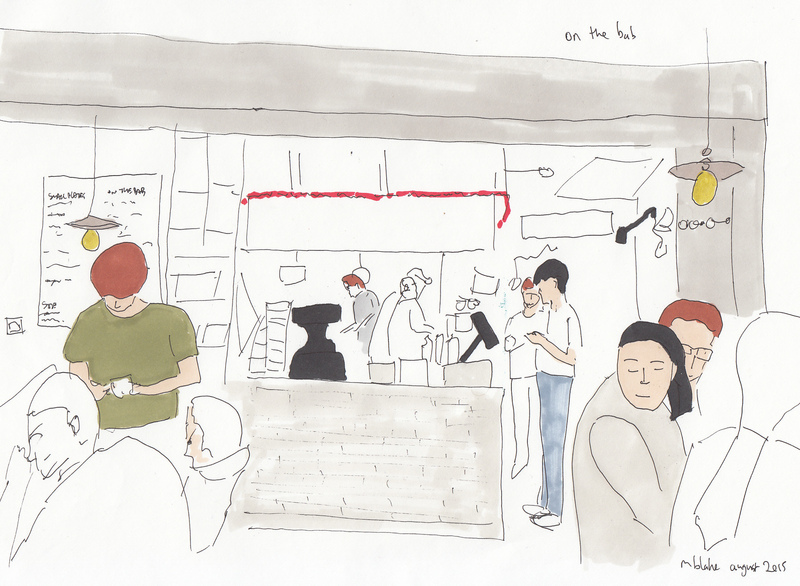 Even after the destruction of K-town to make way for crossrail, London isn’t short of Korean restaurants and On the bab was one of first wave to open in the capital in December 2013. It is owned by Linda Lee, who also founded highly-rated South-east Asian restaurants Koba and Nizuni. On the bab simply means a dish served with rice and their short menu consists of some traditional Korean dishes, including tofu stew and kimchi paella, as well as fried chicken and a choice of beef, pork, chicken or veggies on top of rice, Korean noodles or steamed buns. It has been dubbed a Korean Anju restaurant, which signifies somewhere that serves dishes with alcohol – they have a nice looking list of cocktails using soju (which translates as “burn alcohol” and is composed of a mix of ethanol and water). We went to the original branch in Old Street (they also have outlets in Covent Garden and Marylebone) – the space is small, seating only 30 with minimalist furnishings, lots of light wood, tiles and (of course) filament bulbs. We went along at prime time on a Tuesday night but were seated after a short wait and served very quickly. 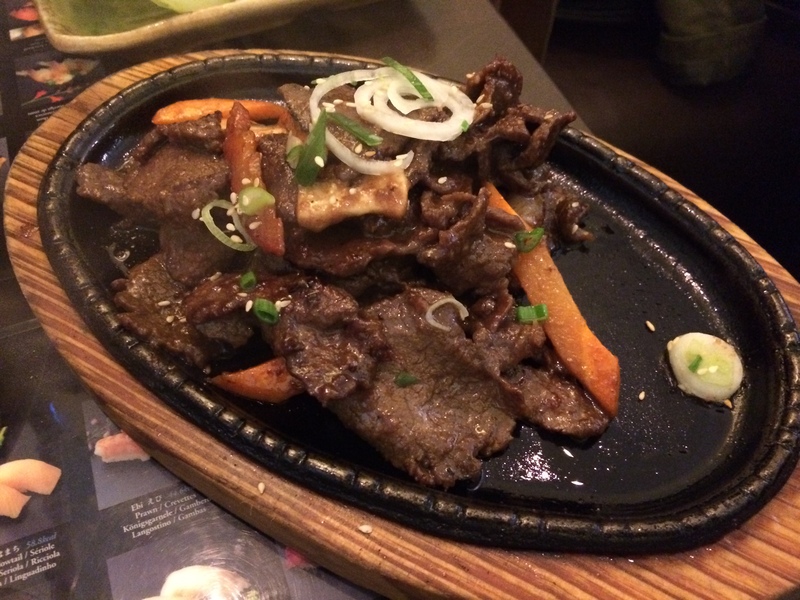 I chose bulgogi beef (grilled marinated beef) on the bab (fantastic value at £8.5) which was served in a massive helping, with mounds of shredded beef on the rice. The quality of the beef was pretty good – it had a nice texture and wasn’t chewy and my rice was perfectly cooked. The shredded cabbage was fresh and the sweetness of the electric orange sauce that it was smothered in worked well with the rest of the dish. The atmosphere was loud and bustling; service was mechanical but efficient enough. The Marksman is a gastropub in Hackney which opened this summer amid a flurry of excellent reviews, most notably a gushing write-up from Jay Rayner. Co-owners Tom Harris and Jon Rotheram made the brave move of buying the pub outright using a combination of their own savings, support from the government’s Enterprise Investment Scheme, crowdfunding and a range of individual investors. They had previously worked together at the Michelin-starred St John hotel restaurant (Harris was Head Chef) which unfortunately ran into financial troubles and closed a few years ago. Rotheram was formerly head chef at Jamie Oliver’s Fifteen and Oliver has also lended some business support to help start up The Marksman. The renovation of the old pub is excellent – they have cleaned and polished the place, but it still looks like an East End boozer, this was enhanced by the smattering of flat-capped cockney regulars propping up the bar during our visit. The menu is curt and reasonably priced (especially given the supreme pedigree of the chef/owners) with starters at up to £8 and mains £12-21. 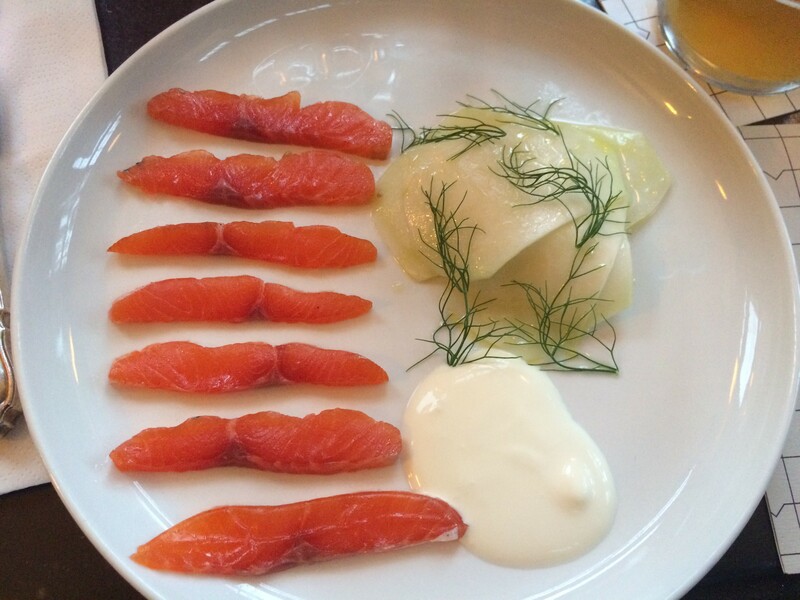 I started with a simple but sublime dish of cured sea trout with kohlrabi and crème fraîche (£8) – the trout was a beautiful deep orange colour and had retained its moisture and freshness even after the curing process. It had a nice amount of fat which lended richness and worked well with the pickled kohlrabi. For me, this was a wonderful example of a confident chef letting his ingredients speak through rather than showing off wizzy technical abilities for the sake of it. 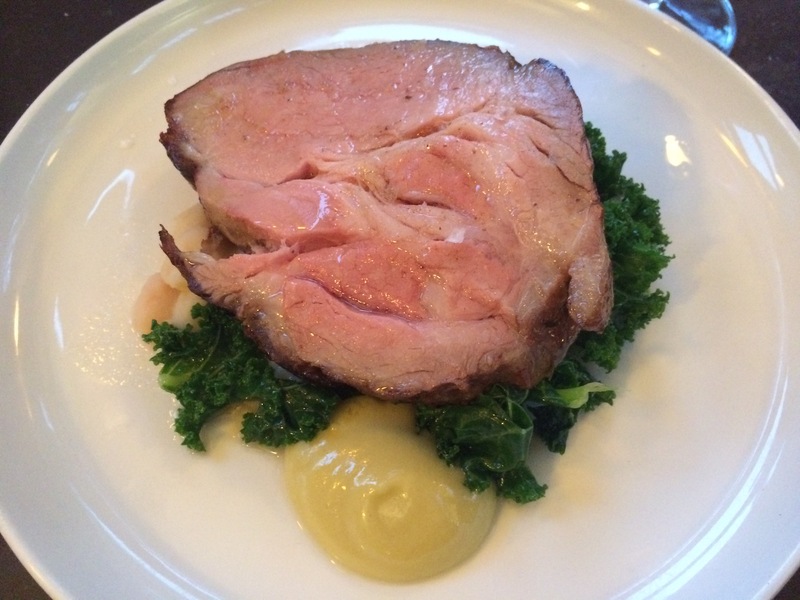 We then ordered some mains to share, including a massive hunk of saddleback loin with coco beans and kale (£16) – the meat was juicy, had a fair amount of character and was great value. I was disappointed with the coco beans which were a tad dry and not very creamy, they should have been cooked in a rich, stocky sauce rather than simply being boiled in water. Plaice with cockles, cucumber and samphire was also served in a generous helping and on the bone which meant it was a lot of work to eat but the flesh was really packed with flavours of the sea. 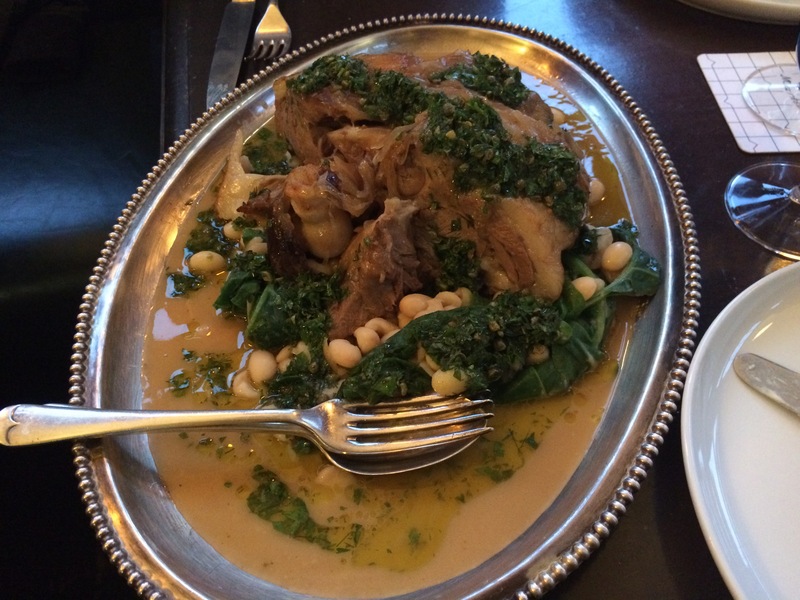 The star of the show was a braised shoulder of lamb with sea beet and mint (£39) – this was served whole along with a puddle of stock and the meat simply fell off the bone. The rustic greens served alongside rounded off the dish nicely. As a true Scotsman, I really enjoyed our artery-clogging fried potato on the side which was concertina-shaped to maximise its fat content. They have a few decent beers and ales on tap, focusing on reasonable but unchallenging beer from the nearby Redchurch brewery. Categories: British, Korean | Permalink. Dotori serve both Korean and Japanese food. For me, the two cuisines do not mix – bold, rambunctious and hearty Korean food bullies its delicate, healthy and subtle Japanese counterpart. Therefore we went entirely Korean on our visit. 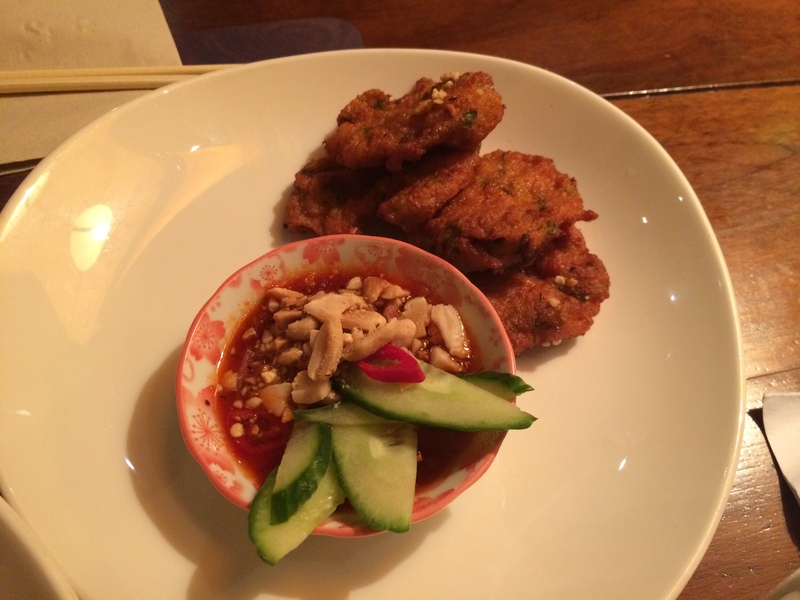 Their starters are mainly Japanese, with the stand-out Korean offering being the intriguing sounding kimchi pancake (£5.5); it is probably best to start your meal with kimchi – they have the option of traditional or cucumber (both £2). We opted for the cucumber which was full of flavour – very tart and with a rich spicy body, the fermentation was perfectly measured so that the cucumber retained its crunch. This was on par with the kimchi that I have eaten in the popular Korean restaurants near Tottenham Court Road in “K-Town”. Dotori have eleven Korean barbecue options (£6.5-9 with a seafood platter at £16) – we went for the safe option of beef and pear which was tasty but unremarkable: the quality of the meat was good – it had been cut very thinly, marinated in a rich soy/pear sauce and then cooked quickly. The seafood options looked more interesting and if you like spicy food you can opt to make any of the dishes extra hot. They also offer a range of meat, fish and tofu-based stews (£7-8) many of which involve beans, be they red, black or soy. We had a half bottle Korean rice wine (£9.5) which was eye-wateringly strong and should not be drank by anyone with a weak constitution. The restaurant is small, noisy, bustling and cramped but still manages to be oddly cosy, possibly because the staff are extremely friendly and the clientele unpretentious. Roast sits in the mezzanine above the bustling Borough Market and has been a successful exponent of simple British food for the past ten years. It was founded by the man who kick started the modern “refined” curry movement in Britain, Iqbal Wahhab, owner of the Cinnamon Club. The menu at Roast is unfussy and seasonal, boasting classics like slow roast pork belly (£22.5), hake fillet (£25) and fish and chips (£16). This being game season, they have a whole roast grouse at £30 and redleg partridge at £24. They open through the week at 7am so we went along early one morning to try their supposedly famous fry-up. The breakfast menu is curt, focusing on Sassenachian (£15) and Scottish fry-ups (£16.5)- the Scottish version boasts tattie scones and a flat sausage whilst the Anglo option centers on bubble and squeak. 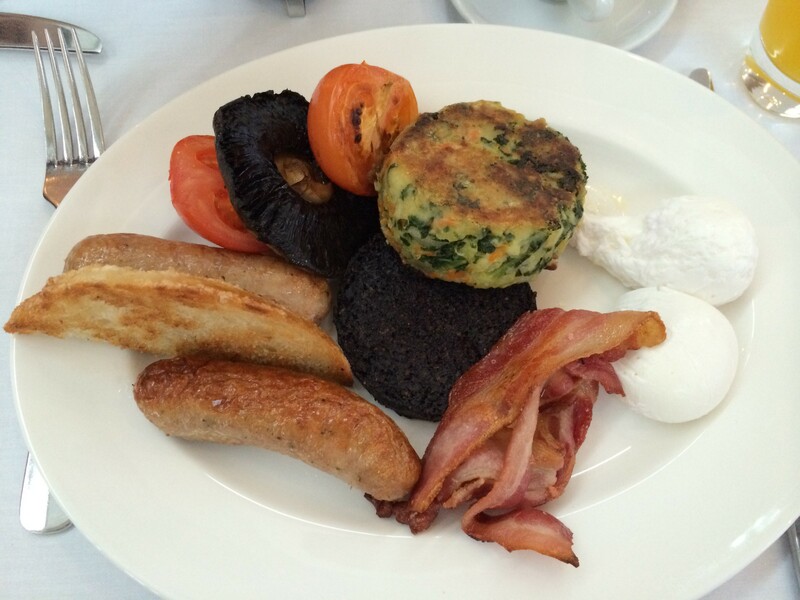 I opted for the full English – the star of the show was the black pudding which is sourced from Ramsay’s of Carluke in west-central Scotland – the texture was moist but it retained a nice crunch, the spicing was subtle and the body rich and earthy. Next best was the bubble and squeak which was composed of light and fluffy potato and slightly sweet but crunchy cabbage, along with the odd slice of carrot, I think it had been fried in butter so it was incredibly unhealthy but mightily tasty. The fried tomatoes and mushrooms were unremarkable – they were rather tasteless and not dissimilar to standard supermarket offerings. Both the bacon and the eggs were of decent quality and cooked well. The major disappointment though was the sausages which are apparently a “Roast recipe” but seemed to be composed of cheap meat and were severely underseasoned. I also had a filter coffee which was truly terrible – unfortunately the London coffee revolution has not yet reached Roast and I hope some hipster baristas invade and string up the oaf that produced such repugnant coffee. 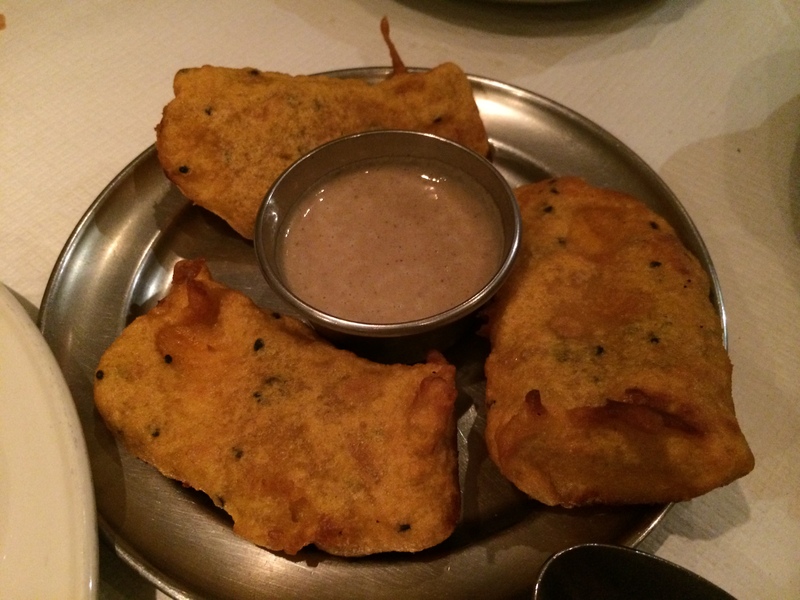 Rasa is a family-run Indian mini-chain – the first (entirely vegetarian) restaurant appeared in 1994 and there are now six restaurants in the stable, including one in Newcastle. We went to the Stoke Newington branch which is painted a gaudy bright pink and about a five minute walk from Stoke Newington train station. The food is Keralan vegetarian (there is a meat/fish serving Rasa Travancore opposite). We started with a great little mix of pickles and chutneys, which are all apparently home made – stand outs were the rich, smooth garlic pickle, the punchy lemon pickle and a fruity coriander chutney. We followed with banana boli (£3.25) deep fried slices of plantain (the batter is made from chickpea flour) served with a salty/sweet peanut dipping sauce – an unhealthy but very tasty starter. Better still was the Bhel Mix (£3.25) which consisted of crispy chickpeas, puffed rice, crunchy noodles, peanuts and onions, all topped with chopped coriander. We then moved onto a selection of curries (all £4.5) which were reasonable but unremarkable: the best was a beetroot and yoghurt dish with a smidgen of mustard seeds which added a slight kick, the day’s special mixed veggie curry was well spiced but its components were overcooked; our aubergine with tomato, curry leaves and coriander was simple but well executed – the aubergine was slightly sweet and not at all greasy. We mopped these up with a fantastic paratha (£2.25) and some light, melt in the mouth poories (£2). Stuck for somewhere open at 11pm on a Friday night, we stumbled across Busaba Eathai, a Thai chain restaurant which now boasts eleven sites across London (they close at 11.30pm at the weekend). Busaba serve generic, cheap and cheerful Thai food, with a range of soup and wok noodle dishes, grilled meats, curries and stir-frys. I think they must rely on customer volume to make money (possibly coupled with cheap ingredients) because their outlets are based in prime locations and the most expensive item on the menu is £12.50. We started with fishcakes and peanut relish (£5.9) which on the face of it was very tasty, but a couple of hours later when we tried to get to sleep we realised that the dipping sauce must have been laced with MSG – I was hot and restless, with a thumping headache. I wouldn’t recommend going to Busaba, but if you do end up going there (probably because everywhere else is closed) then ask for your food to be prepared without MSG. We then moved on to a green chicken curry (£9.5) that was served in a big coconut milk broth, again there may have been MSG involved in this because the sauce was very tasty but not seemingly fresh, the chicken was plasticy and tasteless, but certainly palatable with a big spoonful of said sauce. We also had the chilli prawn rice with mushrooms (£8.5) which was similar to the sort of meal served by high street Chinese restaurants – the rice was cooked well but the prawns were devoid of character. Opening in 1999, Ichiban was the first sushi bar in Brixton – it has survived waves of gentrification and commercialisation and still sits in its original location in Atlantic Road. Ichiban’s history is interesting – I came across some discussion about Brixton people boycotting the restaurant due to staff mistreatment, finding a facebook protest page from 2011 stating that a Latin American couple employed in the kitchen had been dismissed and the owner had refused to pay maternity leave wages and unused holidays (also see photos here). I was oblivious to all of this on my visit to Ichiban and will focus my review on the food, which was decent, although given this mistreatment case I am now not sure I will return. The menu is vanilla Japanese with a mix of sushi, sashimi, soups, curries and fried rice dishes. The pricing is very keen with curry and teriyaki dishes all at £6.5-8, sushi pairs £2.7-4.5 and sashimi sets around £10. 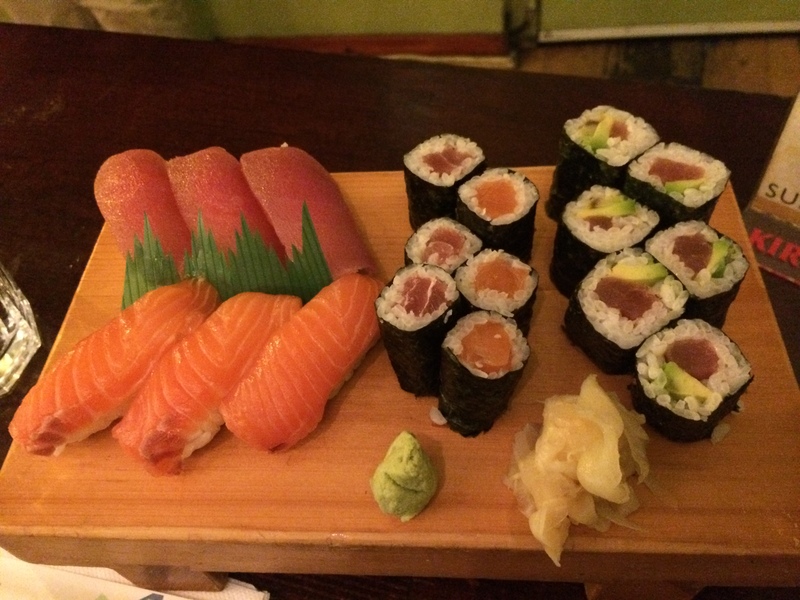 After starting with a decent miso soup we opted for a range of tuna and salmon sushi and sashimi. The fish was very well prepared and fairly fresh – the rice was rolled quite loosely and retained a bit of crunch and texture. The dining area is very much no frills but the waiting staff were friendly and attentive. Categories: Breakfast, British, Indian, Japanese, Korean, Thai | Permalink. Stuck for decent lunch options in Soho, my friend suggested we head to “K-Town” – a row of down at heel looking Korean restaurants behind Centre Point and a short walk from Oxford Street. 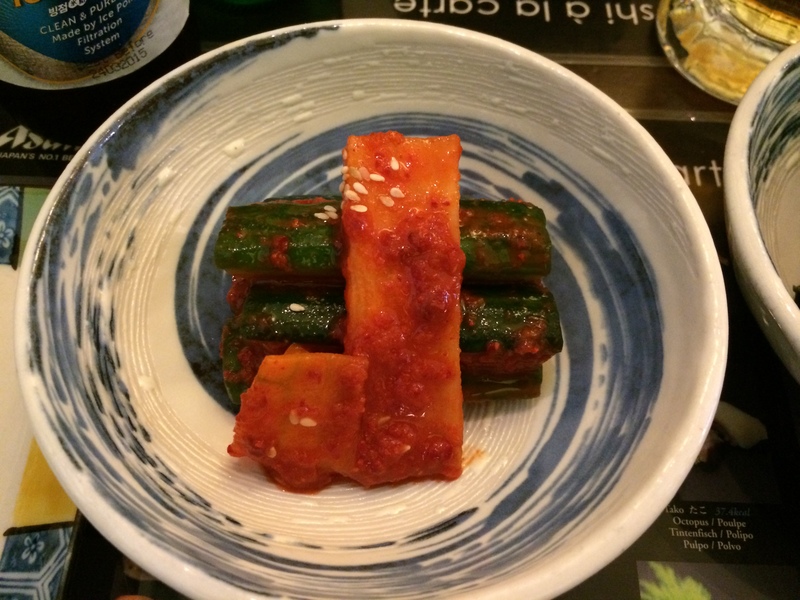 I had never eaten Korean food before, and, conscious of quite a few new Korean restaurants springing up around London, I was keen to see what all the fuss was about. 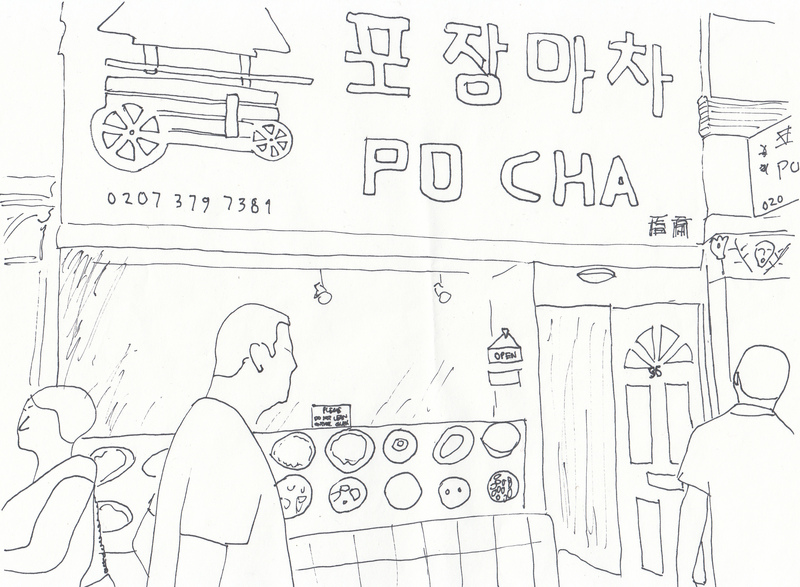 We chose Pho Cha because it appeared the busiest and most inviting of the restaurants in K-Town, it also seemed to have a predominately Asian clientele. The restaurant is split over two floors, with the downstairs dining area being a bit more dingy than the main area on the ground floor – we arrived pretty early and were able to get a seat at the bar in the main room. The space is dark and low ceilinged, and takes turns at becoming very dark as large buses stop directly outside. The tinny Korean pop being played on loop and non-English speaking waiters add to the authentic atmosphere. 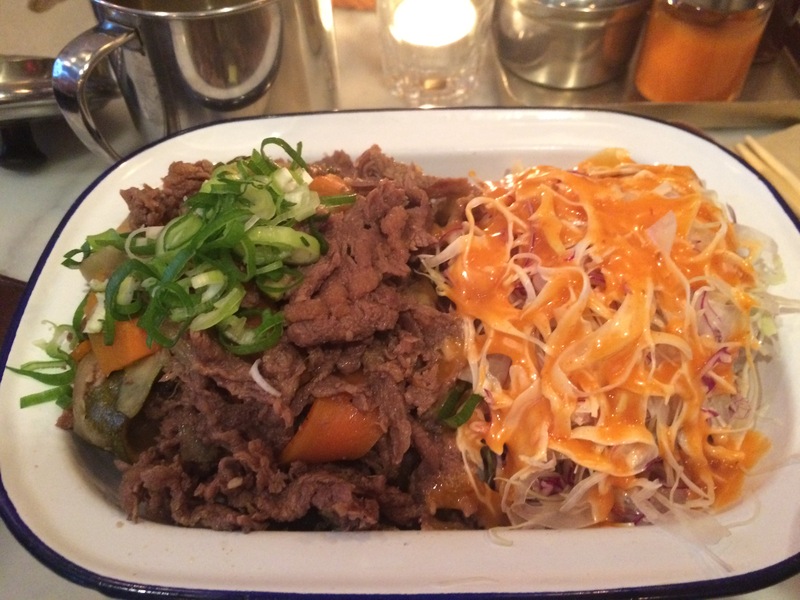 They do a great value set lunch menu for £5.50 which involves a main dish and rice along with kimchi or miso soup. The main menu is quite long and I think some items are lost in translation; starters seem to be mostly pickled vegetables, supplemented by dumplings and “pan cake”; there is a small section of rice cake dishes followed by stews and then cold and hot noodle dishes. 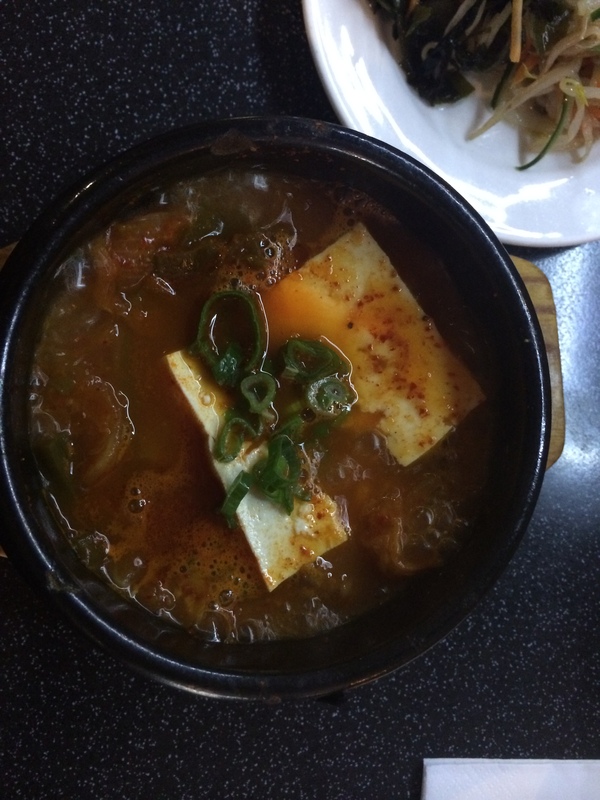 I was keen to try kimchi (fermented Napa cabbage) and so ordered the kimchi stew from the set lunch menu which was served in a hot stone dish and based on pork and tofu with a spicy stock and rice. The food arrived very quickly, blocks of tofu and nuggets of pork sizzling menacingly in a stone throne – the rice was spooned straight from a rice cooker behind the bar and was wonderfully sticky yet still firm. Once the dish had cooled to a suitable eating temperature (which was about five minutes after serving) we tucked in – starting with the creamy, light tofu which was enhanced by the rich pork stock. The pork chunks were not plentiful, but they were soft and slightly fatty, so they melted in the mouth. And the kimchi was amazing – tart, slightly bitter and with a lovely crunch, it warmed the cockles of my heart. The non-smiling staff were efficient but generally aloof, although they did seem amused by my taking pictures of the menu. I will definitely be going back to try their a la carte offerings and discover what “pan cake” is.